Ancient Anasazi cliff dwellings, mysterious petroglyphs, and a breathtaking horseback ride in Canyon De Chelly. As I rode out of a small area shrouded in cottonwood and Russian olive trees to get my first glimpse of the cliff dwellings of the Ancient Pueblo People, known by the Navajo as the Anasazi, I was in awe. 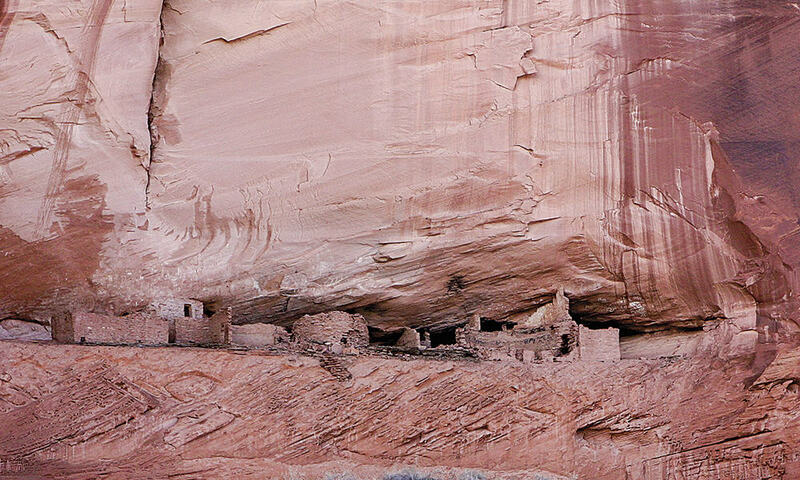 Carved high into a red sandstone cliff peppered with snow, these seemingly inaccessible cliff dwellings, which housed dozens of families, were built sometime between 1100 and 1300. 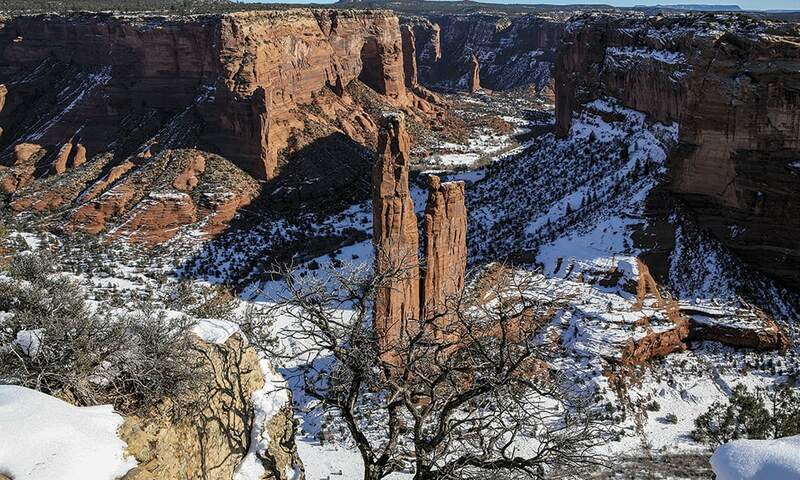 They are located in Northeastern Arizona in stunning Canyon de Chelly, a place any cowgirl would be lucky to explore on horseback with a Navajo guide. Canyon de Chelly is one of the largest sandstone canyons in the United States. Riding through the canyon may make you feel very small, but also well-tied to the past. Along the walls of this canyon lie pictographs, petroglyphs and cliff dwellings that give clues about the canyons’ past inhabitants. My guide Lee Bigwater talked about these mysterious images, as I sat atop one of his horses, a Mustang Quarter Horse mix named Half Moon. 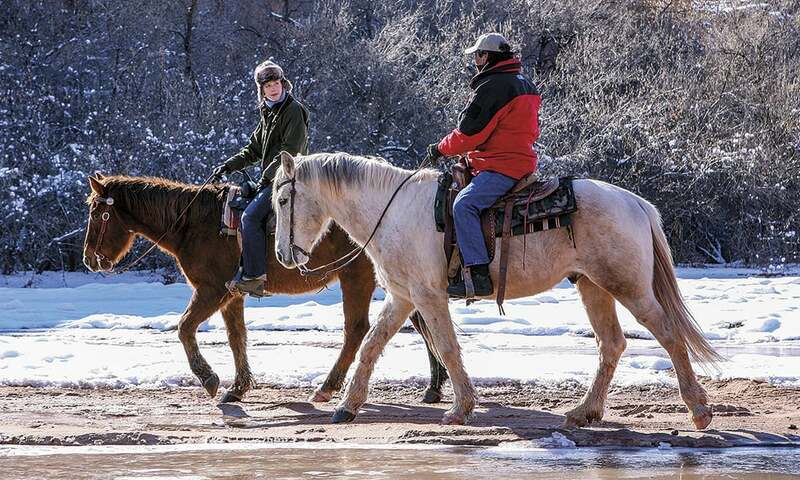 Author Darley Newman and her Navajo guide, Lee Bigwater, explore the canyon. In order to explore the interior of Canyon de Chelly, a national monument that is supervised by the National Park Service and the Navajo Nation, you have to be with an authorized guide, but this can be a good thing. There’s something really special about seeing the canyon with a guide like Lee Bigwater of Totsonii Ranch, who as a child spent his summers in the canyon. Hearing Lee’s stories made me understand the strength and closeness of the Navajo community within the canyon. Getting in and out of the canyon is not easy even today. Riding horses is still one of the best ways to explore. While we rode through on horseback, our camera crew, who was attempting to film us for our PBS TV series Equitrekking and sometimes also ride horses during the filming, got their vehicle stuck attempting to cross a river. Depending on the time of year, there are lots of rivers and streams to cross within the canyon. This isn’t a location where you can just ring the tow service and have them pull you out if you get stuck, but thankfully Lee called his friends, who towed our SUV out of the water, and we were able to continue our filming. Anasazi cliff dwellings carved into the canyon’s red sandstone walls; spectacular vistas through the canyon. I could only imagine what life was like for the Pueblo people, who hunted, farmed and worked in the canyon more than 1000 years ago and the Navajo who settled the canyon in the 1700s. Lee told me about the sometimes two day trip to the trading post that Navajo families would make, their wagons filled with sheep wool and mohair. They would be traveling the same dirt trails we were riding, past sheer red cliff walls, some of which reach one thousand feet high. As Lee and I rode further into the canyon, we passed sheep and cows, as well as Navajo homes. Further still lay Spider Rock, an eight hundred foot rock spire, in which the Spider Woman, part of the Navajo creation stories, resides, as well as other fascinating sights. Everything was so quiet and peaceful, especially from my seat on my mount. As we continued our ride, I began to more fully understand why the Navajo believe that Canyon de Chelly is a spiritual place and why horseback riding is one of the best ways to experience its splendor. (Originally published in the March 2016 issue of Cowgirl Magazine).